Prime Minister Shri Narendra Modi attended a function for Demonstration of Retrofit Electric Bus at Parliament House in New Delhi on Monday. 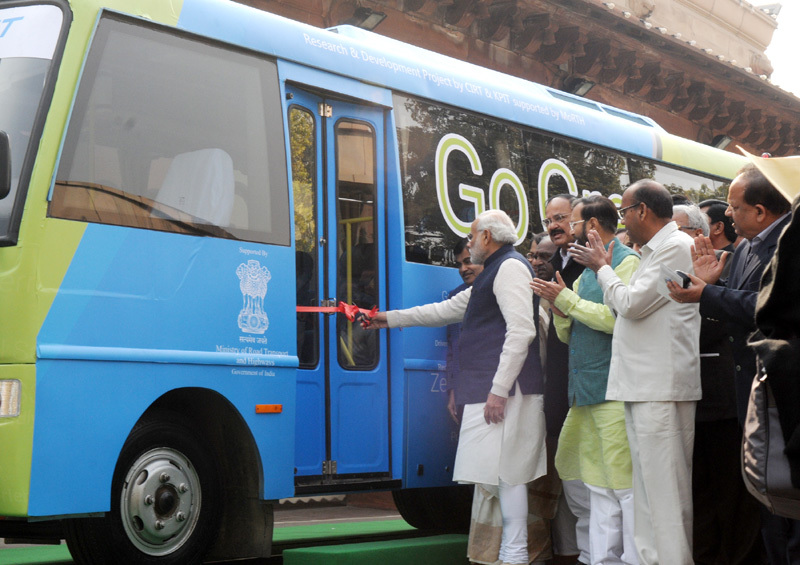 The Prime Minister Shri Narendra Modi attended the demonstration of the first prototype of a diesel bus converted into a battery operated electric bus at a function in Parliament today. Speaking on the occasion he said that pollution has become a matter of grave concern in our everyday lives and finding a solution to this problem is a major challenge today. Referring to the recently concluded COP 21 meet in Paris, the Prime Minister lauded two of its major initiatives aimed at promoting green energy – one on innovation and the other on the Global Solar Alliance of 120 countries. He said the cost effective, environmentally clean electric buses are a significant step in the direction of combating pollution. The Prime Minister called the retrofitted electric buses a new gift from “Make in India” and called upon the youth to come forward to make cost-effective, long lasting batteries to promote the making of more such electric buses which can be incorporated in our public transport system. The Prime Minister presented the keys of the first retrofitted bus to Hon’ble Speaker Smt Sumitra Mahajan who was also present on the occasion. The bus is proposed to be used by Members of Parliament. Speaking on the occasion Minister of Road Transport & Highway Shri Nitin Gadkari said that the cost effective, pollution free and import substituting retrofitted electric buses demonstrate the government’s commitment towards Make in India and its resolve for fighting vehicular pollution. He said ISRO is making Lithium –Ion batteries which will cost only Rs 5 lakh as against the Rs 50 lakh cost of imported batteries. He called upon Parliamentarians to make maximum use of the retrofitted buses and make them popular. In order to fight the growing pollution that results from harmful emissions from diesel buses, the Ministry of Road Transport & Highways has taken up an initiative of converting existing diesel buses into non polluting electric buses. Electric buses are considered to be the most environment friendly form of public transport in urban areas. Procurement of new electric buses is on the agenda of various State Transport undertakings. In this context the converted buses would be very useful as they would cost about one-fourth of the cost of a new electric bus. The converted buses are part of a pilot project of Central Institute of Road Transport (CIRT). The project will demonstrate the Government’s commitment to reduce vehicular pollution while opting for strong environment friendly mobility solutions. The prototype has been developed by by KPIT, Pune with consultations from CIRT. The technology has been wholly developed in India. Ten more buses are proposed to be retrofitted for use by State Transport Undertakings by March 2016. Large scale conversions of diesel buses to electric will be taken up after evaluating the success of the pilot project. Minister of Parliamentary Affairs and Urban Development Shri Venkaiah Naidu, Minister of State (I/C) Environment , Forest & Climate Change Shri Prakash Javadekar , Minister of State (RTH & Shipping) Shri Pon Radhakrishnan and several Members of Parliament were also present on the occasion.